17 years since Love and Money broke up, apparently for good, they’re back. After reforming for a one-off show as part of Celtic Connections 2001 to play their albums “Strange Kind of Love” and “Dogs in the Traffic”, the band decided that it worked so well they should take the show out on tour. Which is why I’m at Shepherd’s Bush Empire with PlusOne to watch Love and Money in London. Unsurprisingly, there are a lot of Scots in the audience which is fiercely and vociferously partisan. The venue isn’t quite full, but the enthusiasm on display more than makes up for that; they’re all here to see the band triumph. This is the classic Love and Money line-up with the addition of Ewen Vernal (ex-Deacon Blue among others on bass) and the wonderful Frazer Spiers on harmonica and backing vocals and they’re obviously up for a good show. The musicianship is exceptional throughout as the band do their bit to showcase the well-crafted songs, James Grant’s baritone vocals and exceptional guitar work. James Grant is the perfect frontman; stick-thin, suited, in shades and able to entertain the audience between songs with stories about BB King, Tina Turner, Simply Red and his dad’s life in Glasgow. The night is split into 2 halves. The first half is the whole of the 1991 album “Dogs in the Traffic”, which the band obviously feel is slightly less popular, followed, after the interval, by all of “Strange Kind of Love”. Whatever the band might think, there are plenty of highlights in the first half including “Whisky Dream” and the anthemic “Looking for Angeline”. “Pappa Death” shines out from the set as a song which was made for live performance; the album version seems insipid in comparison with version delivered tonight. The “Strange Kind of Love” half of the performance features all the tracks except one from the album. The squeaky-clean, shimmering Gary Katz production of the album is impossible to recreate live, so the songs are much more raw, but no worse for that, relying on great playing rather than studio expertise. It’s difficult to pick out highlights because the performances are all great but the audience are all shouting for the big single “Jocelyn Square” and it’s a huge moment when the guitar intro finally kicks in and the band launch into a powerful version of a great song about lost love and innocence. The song from the album which doesn’t feature in the set is saved for the encore; “Walk the Last Mile” is dedicated to the late Bobby Paterson, former bass player with band who died in 2006. It’s a touching tribute to a great musician, who is obviously still missed by the rest of the band. Throughout the evening James Grant makes references to Love and Money working together again and confirms this towards the end of the set, announcing a new album and full UK tour next year. The band go out on “Candybar Express”, which James Grant describes as “the most moronic song I ever wrote” and it’s all over. 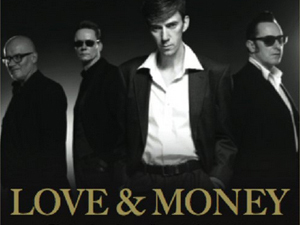 Love and Money are back, they’re as good as they ever were and they’re recording new material. If you like songs that are well written and well performed with a nice line in Glasgow patter between songs, then you really should get out to see these guys next year.